all heard it it, “Mom/Dad, I need a superhero costume for spirit day tomorrow.” In a house filled with craft supplies, dress up clothes and a fashion conscious twelve year old, that really isn’t as panic inducing as it would have been a few years back. We are big Green Lantern fans (well, my husband is and it rubs off over time), so I vaguely knew that there were other lanterns out there, guardians of the emotional spectrum. 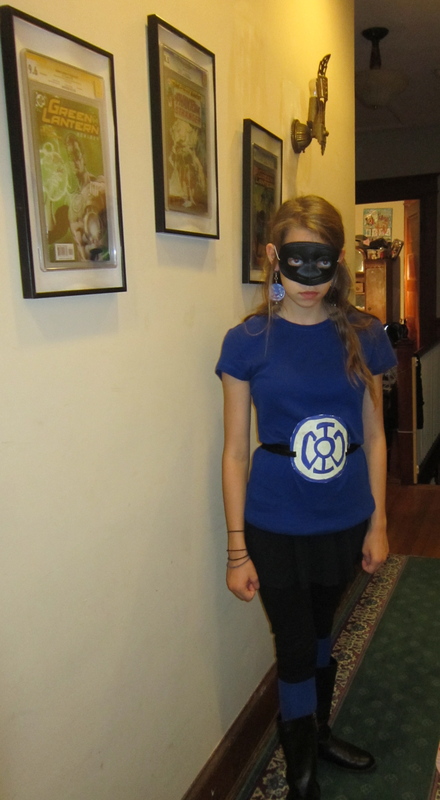 Rebecca decided to be a “Blue Lantern,” created after the Guardians kicked out two unique individuals who couldn’t toe the line. These guys chose “hope” as their motto, so my daughter thought they would be an inspiring selection. How do you make a super hero costume for 93 degree weather and no spandex in sight? Read on. 1. Start with her closet. 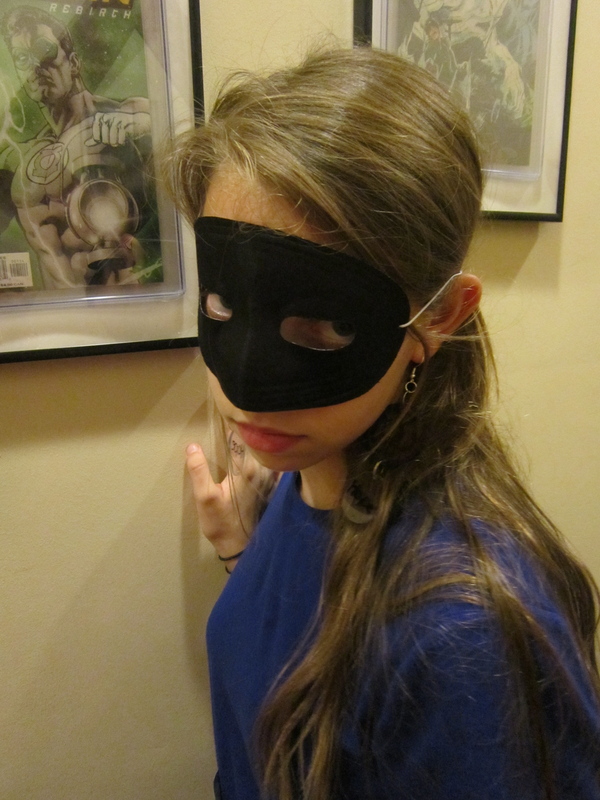 Short black leggings make a great start for a summer super hero. Rebecca layered a super short black skirt over them and added a bright blue top, a brand new hand me down from older cousin Hannah (a hannah-me down?). She dug around in the soccer drawer till she found bright blue socks (nice and long) and added a pair of black boots. We may already be in an overheating zone, but at least she can dump the leggings, socks and boots later in the day and still be a super hero if necessary. 2. Make a medallion. Superheroes are nothing without their medallion but we didn’t want to mess up her new shirt and we needed something to keep the blue/black theme going. A piece of heavy craft paper with Blue Lantern’s symbol drawn on with Sharpie was quick. Snip a slit on each side and slide a length of black fabric through and you have a medallion and belt in one. 3. Add a personal touch. 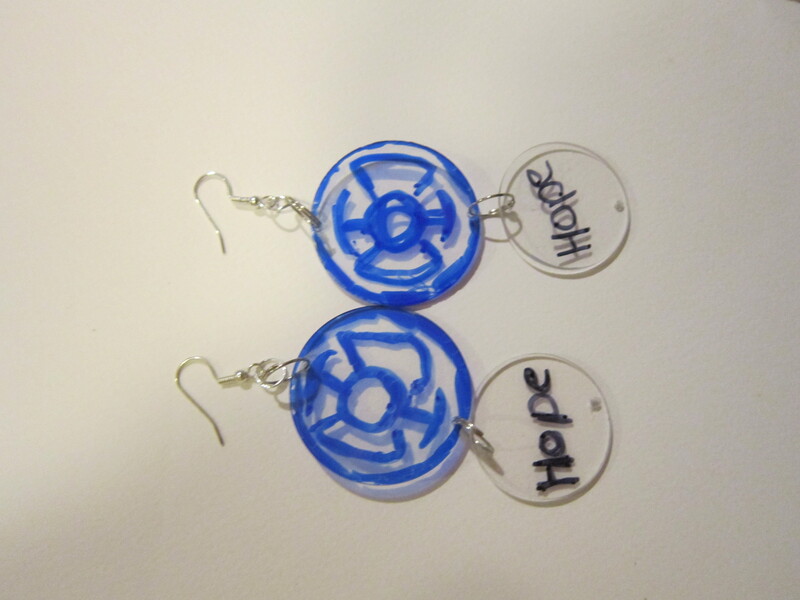 In this case, we made blue lantern earrings to give the costume some extra pizzaz. I have lots of jewelry supplies, so whipping up earrings isn’t a problem , but you could put mini paper medallions over existing earrings. If you happen to have funky plastic Christmas discs (as do I), draw that medallion symbol again. 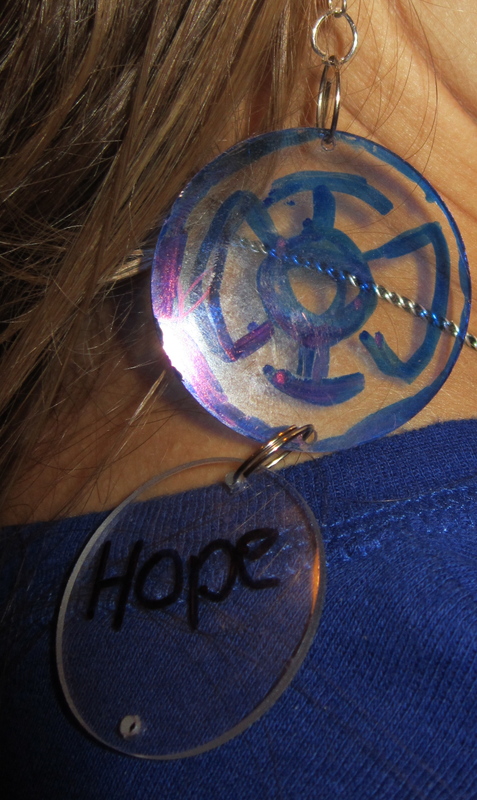 Rebecca added “hope” to each one. A nice touch, huh? The best part about this costume? It was a labor of love for Rebecca and me; we did it together, bounced ideas off of each other and had a lot of fun making something from nothing. I’m telling you, when all else fails, you really can call on Green Lantern, or Blue Lantern, or even Indigo Lantern. And if you must know, there are bad guys in this rainbow, too, so all your bases are covered.